Rep. Keith Ellison (D., Minn.), who is also the Democratic National Committee's vice chairman, won the Minnesota attorney general primary on Tuesday and continued denying allegations he assaulted an ex-girlfriend. Ellison beat the runner-up in the Democratic primary by at least 30 points, despite the recent allegations, the Washington Post reports. Ellison addressed the matter while speaking to supporters at the Nomad World Pub in Minneapolis. "We had a very unexpected event at the end of this campaign that happened. I want to assure you that it is not true," Ellison said. "We are going to keep on fighting all the way through. We are going to be respectful to all, and we are going to stand like steeples, and insist upon the truth." Ellison spoke to the media, who had not received any guidance on his recent events, and said he would address the matter again soon. 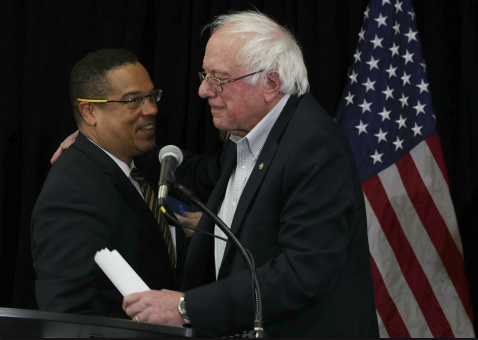 "We’re going to talk about all of this stuff in the days to come," Ellison said. "I want to honor you guys and let you know; we’re not trying to avoid the topic. We will handle it head on. They are not true, but we will handle them in the days to come." Three days before the primary, Ellison's ex-girlfriend, Karen Monahan, accused Ellison of physically and emotionally abusing her. She also claimed to possess a video of Ellison dragging her out of bed and shouting at her, although she says she will not release it. Feminist groups Ultraviolet and the National Organization for Women called for Ellison to quit. This entry was posted in Politics and tagged DNC, Keith Ellison. Bookmark the permalink.